In the fifth inning of Friday night’s game in Boston, the (then) last-place Red Sox took a 4-3 lead over the (then) second-place Orioles. It was the last time the (still) last-place Sox would have a lead over the (now) first-place O’s during the weekend’s marathon three-game set. Approximately 42 hours after the Sox took that lead, the Orioles bullpen had thrown 22.2 innings (two of which were ironically pitched by their designated hitter) and allowed just one run. And with a three-game sweep of the Red Sox, a team most people assumed would be terrible this year, had the best record baseball. In 2011, only three teams had a worse bullpen ERA than Baltimore. This year, all 29 other teams do. Forget the return of the silly bird and/or Matt Wieters being the responsible for the Orioles resurgence, the real reason has been their bullpen, a random collection of little-to-no-name guys collectively pitching like Jim Palmer, had Jim Palmer been slightly better than Jim Palmer. A brief Google search tells us that the nameless, faceless 2012 Orioles bullpen has no nickname. That needs to change. So let’s call this random collection of hired guns the O’xpendables. Who are these dudes, exactly? Well, there’s closer Jim Johnson who’s pitched 12.2 innings this year without allowing a run. There’s also Matt Lindstrom, a flamethrower who couldn’t stay healthy and/or throw strikes until last season in Colorado, when he was 31 years old. The Orioles are Lindstrom’s fourth team in four years, and so far this season, he’s thrown 13 innings and has yet to be scored upon. Then there’s journeyman Luis Ayala, pitching for his sixth (!) team in four seasons. In over 15 innings of work, he hasn’t allowed an earned run either. Meanwhile, submariner Darren O’Day, who was released by the Rangers last winter, has allowed one run in 14 innings. In fact, former closer Kevin Gregg (5.19) has the only unsightly ERA of the bunch. He hasn’t allowed a run in three weeks. Too often the narrative around an unexpected baseball story is “Here’s why it won’t last” instead of “Isn’t it cool this is happening?” And here we are a week into May, and after years of futility, the Orioles are the only team in baseball yet to lose 10 games. Even the biggest Ripkenhead in the world can’t possibly expect the Orioles relievers to continue allowing a run every other day. Still, anyone who watches baseball knows that success can be contagious. If a couple guys start hitting, suddenly it seems whole team starts hitting. And unless Orioles pitching coach Rick Adair has mastered The Secret, this O’xpendables situation seems no different. But look around the division. You’ve got the equally hot Rays, then the Yankees, who recently lost the best closer in the history of the universe. The Blue Jays made a big new bullpen acquisition, but he allowed nine baserunners in five innings before being placed on the DL himself. And of course there’s the Red Sox, who counted on their bullpen being held down by a guy released by the Yankees a little over a year ago, and this. Pissah. Meanwhile, the Baltimore Orioles not only sits atop the AL East but also own the best record in baseball. And much of this has to do with the group of unknowns and castoffs who sit behind the outfield fence, waiting to keep the O’s in the game. Will it last? Does it matter? 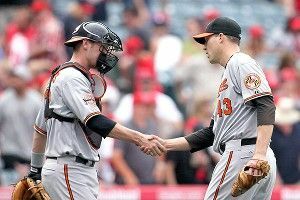 Albert Pujols finally hit a home run, and eventually the Orioles bullpen will give up a few. But for now, baseball’s back in Baltimore. Everyone’s smiling. Especially this guy.